San Francisco is awash in small corner grocery/liquor/small deli stores. In some neighborhoods it’s not unusual to see two stores kitty-corner from each other, learing across the intersection. Most sell pretty much all the same items and manage to eek out a living by selling mostly beer, ice cream and snacks. They are in the truest sense convenience stores, without much unique character, and existing because on occasion it’s more convenient to walk a half a block in your slippers and spend a bit more cash on a quart of milk, a quart of beer, or a quart of ice cream. Occasionally, one of these corner markets re-invents itself, either through new owners or new ideas, and is able to set itself apart by its fresh produce, excellent home-made food, or inspired grocery/booze selection. In San Francisco, Bi-Rite Market is perhaps the marquee example of this, transforming what was once just a dingy store into a burgeoning foodie empire. Healthy Spirits is another good example. 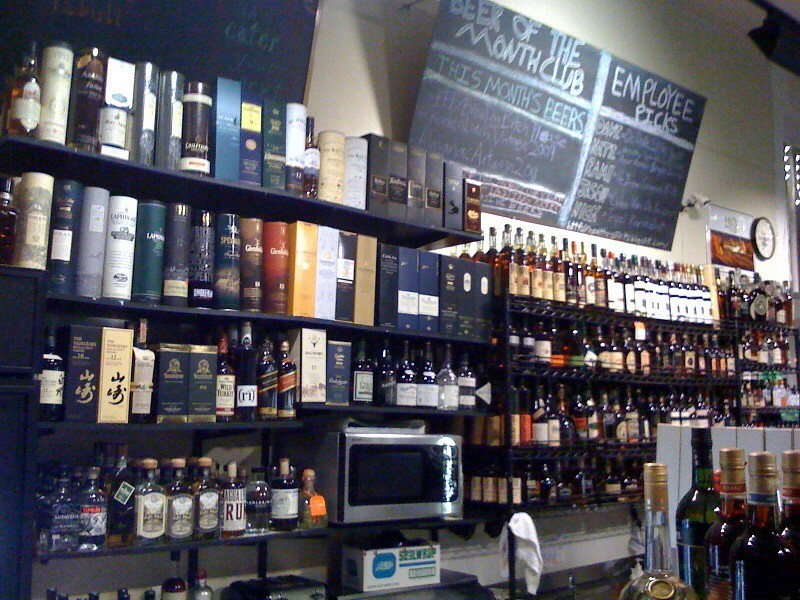 Located on the corner of 15th and Castro, they’ve transformed the usual corner store pedestrian selection of beer, wine, and spirits into one of the best beer selections in the city with a respectable bunch of whiskies and wines as well. They also have a highly regarded hummus and a smattering of other local treats, but being a whisky blogger, what do I know from hummus? Whisky-wise, there’s a decent selection of Scotch, 40-50 bottles worth, nothing too surprising, with a few independents and less common distillery bottles along with the usual suspects. A really nice American whiskey selection is filled with the stalwarts, the new big company expressions, and a good variety of the more impressive craft distillery output. While you probably wont find the rarest, most unusual whisky here, you can definitely find a new one to try yourself or that special bottle to give as a gift to your favorite local whisky blogger. The best reason to visit Healthy Spirits, though, is their phenomenal beer selection which rivals City Beer Store for the best in the City. They’ve got everything here: acres of Belgians, a good mix of American craft sixers and special big bottles, and all shapes and varieties of the best, most interesting beer from around the world. One could spend hours, slack-jawed and thirsty, standing in front of their entire wall of coolers, trying to decide what to buy…and this is where the staff comes in. The folks at Healthy Spirits obviously love this stuff and, appropriately enough, they love talking about it. So if you’re feeling befuddled as to what to buy, speak up, they’re only too happy to help. Outside of the store, you can find good info from them as well via their blog where they regularly post all the new arrivals, monthly beer club and monthly bourbon club. Prices on both beer and spirits are perhaps a little high, but understandably so, this is not a big, multi-location liquor barn, this is a small specialty store. If you’re any kind of beer fanatic, bourbon hound, or general booze-nik, and you find yourself in San Francisco, Healthy Spirits is definitely worth a visit. Thanks for sharing! I’ll definitely stop by on my next trip to SF (in Jan ’12!). I do love a well run specialty shop and don’t mind paying a wee bit more if the people that run stock a quality product and can offer assistance when the need arises. There’s a tiny store on the corner of 10th & Pine Philly called The Foodery. 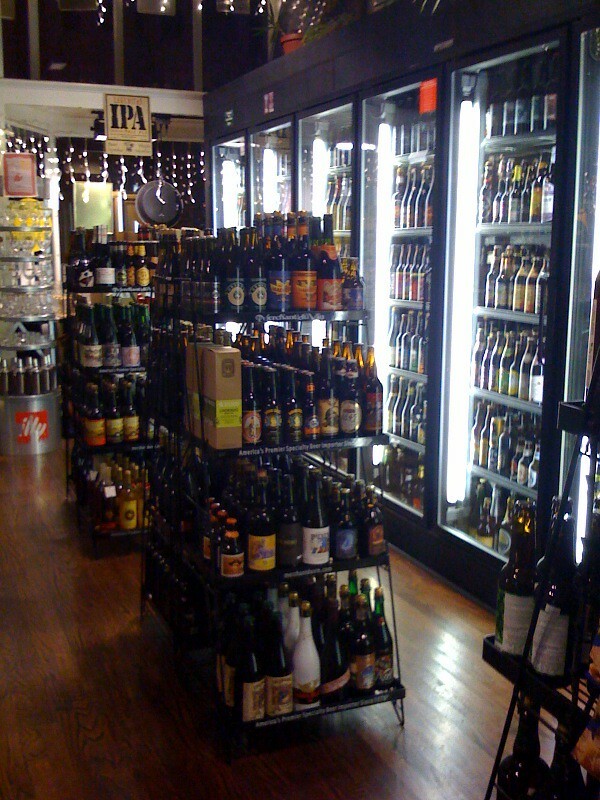 The place can’t be any larger than 250 square feet, but they must stock well over 200 varieties of beer from around the world. While their prices can be quite high at times, they do let you buy mixed six packs (they also have volume discounts). I’m fine with paying a bit more for variety and high quality. Nice review! Sounds like a great little place.